I think I may have set a record for being good this year, at least most of the time. 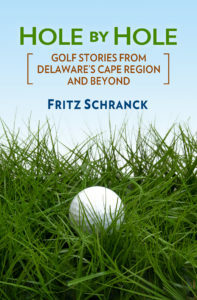 And since you and my family and friends know how much I love golf, I’m sure that you’ll be thinking about a golf-related Christmas gift. Just so we’re clear, however, there are still some items I’d really rather not receive, if it’s all the same to you. 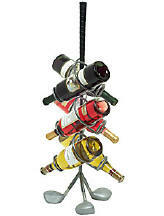 For example, I saw this Golf Club Wine Rack at The Golf Warehouse website, listed at $69.95. The ad says it uses authentic steel club heads for the feet, and a real club grip for the handle. 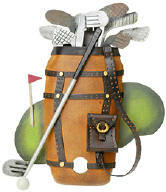 The thing is, I can’t ever remember carrying six bottles of wine with me while I played golf. I also appreciate the thought, but I don’t really need a Golf Bag Night Light, on sale at The Golf Warehouse for $29.95. Pardon me, but I don’t think so. 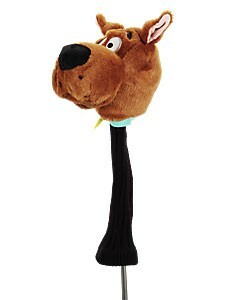 I’m also sure that some folks of a certain age might get a real kick of receiving their own Scooby-Doo Plush Headcover from the same store for only $19.95. The folks at The Golf Warehouse even go so far as to say it’s “Fun for any age,” which I think is just a tad presumptuous on their part, don’t you? Well, yes—yes, they certainly will. If we’re lucky we’ll have a white Christmas here in the Cape Region. On those happy occasions, I often like to keep warm and curl up with an afghan. 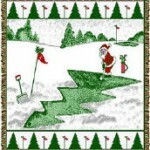 However, if the afghan in question is the Golfing Santa Holiday Throw, sold by Austads for $49.95, I think I’d rather shiver. Something about the image on that blanket, of you putting on a green shaped like a flattened Christmas tree, doesn’t really do it for me. Speaking of warm, we recently had a cord of firewood delivered to our house. 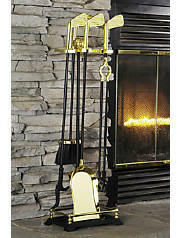 And while I appreciate the gesture, I don’t really need to have own Five-Piece Clubhead Fireplace Set, like the ones sold at The Golf Warehouse for $79.95. I’m well aware that it includes “Polished Brass Clubheads” as on top of the broom, shovel, poker, clamps, and base, but there are several non-golfers in the family who might get the wrong idea about my real golf clubs if they see these, okay? I’m also well aware that the winter-time is when we set out food for the birds. 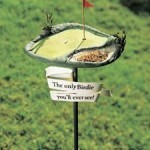 Just the same, I think I would rather use something for this purpose other than the Golf Style Birdie Bird Feeder sold at Austads for $30.95. The website catalogue says that its “stylish.” I guess in one respect they’re absolutely correct. It’s just not a style I like–not at all, in fact. 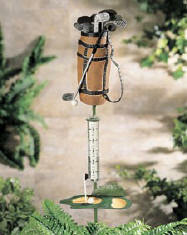 And while we’re on the subject of garden implements, I’d also really rather not be given my own Golf Style Rain Gauge that Austads is selling for $19.95. They might be correct about it functioning and all, but “nostalgic”? Anyway, thanks again for giving me the opportunity to tell you what I’d really like to not receive this Christmas. Have a great holiday yourself, and say hi to the elves for me.